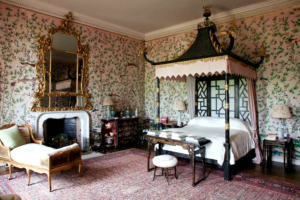 Chinoiserie is a term borrowed from the French that indicates the European fanciful interpretation and imitation of Chinese and East Asian artistic traditions. 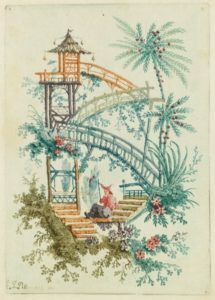 Products imported from China and Japan were extremely fashionable: this led Victorian craftsmen to create their own fanciful versions of designs from the far East, a mysterious and exotic place. In the first decades of the 17th century European craftsmen began to reproduce on their products decorative forms found on cabinets, porcelain vases and embroideries imported from China. 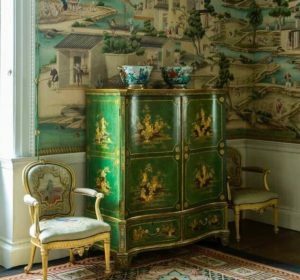 It started in Britain and Italy, but truly spread from France when Louis XIV ordered a major chinoiserie interior scheme for the Le Vau’s Trianon de porcelaine at Versailles, in 1670-1671. Thierry Bosquet’s reconstruction of the Trianon de porcelaine, a small property in the village of Trianon built in 1670 by the architect Louis Le Vau on orders from Louis XIV. Print of an Asian landscape by Jean Baptiste Pillement from his work “A New Book of Chinese Ornaments”. Since Jean Pillement published the influential collection of prints – A New Book of Chinese Ornaments – in 1755, more and more objects featured fantastic landscapes with animals such as dragons and extravagant birds, which paired exceptionally well with the lavishly exaggerated Rococò designs in vogue at the time: the asymmetry and the dynamic lines of these two styles were often combined together in interior decoration. 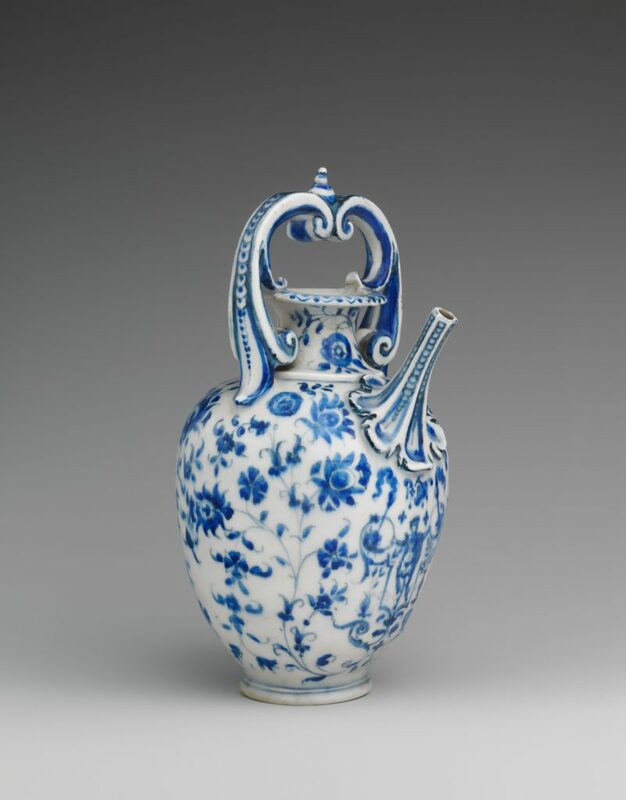 European designers copied Ming-style blue-and-white patterns onto jars, vases, and tea sets. These objects were primarily used for storage but, when imported to Europe, they took on their reputation as a decor classic: the culture of drinking tea required an appropriate chinoiserie mise en scène, especially for elité class women such as Queen Mary or Queen Anne. – Original tea set of Chinese porcelain, Ming dynasty style. – A white and blue tea set (Dutch Delft) from the 18th century. Victorian House with lacquered wood dresser. Traditional Asian lacquerware pieces are true works of art and require immense skill to craft. To achieve lacquer’s signature shine, a piece of furniture must be coated with numerous layers of tree sap. Once the glossy finish has been completed, lacquer pieces are often further embellished with hand-painted scenes, inlaid details or intricate carvings. Foo dogs are domesticated lions that date back thousands of years to Imperial China where they were used to guard palaces and temples. They are typically represented in pairs—one male and one female—to signify the balance of yin and yang. People in Chinese clothes are often featured: sometimes these figures were copied directly from Chinese objects, but more frequently they originated from the designer’s imagination. Pagodas are an integral part of East Asian architecture, assimilated in China thanks to the spread of Buddhism. Dragons symbolized strength and good luck in Chinese mythology and folklore. Nature scenes, including lush garden vignettes with pavilions and floral themes, were used in many designs amongst the houses of the upper European class, especially for handmade wallpapers. 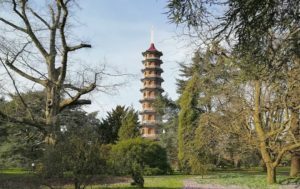 The botanical gardens at Kew, established in 1759 by the Dowager Princess Augusta whom employed the architect William Chamber. Ewer, Medici Porcelain Factory; Florence, Italy, 1575 – 1587. How did it Become a Fashion? The rising of the chinoiserie is due to the growing interest that Europeans began to develop during the 17th century towards eastern cultures. In fact, its acknowledgement derives from the current of Orientalism, which studied the cultures from the Far East of the world, from a historical, anthropological and philosophical point of view. It was also fuelled by the spreading of collecting, especially focused on eastern products and architecture.